Maintenance script that merges $wgExtensionMessagesFiles from various extensions to produce a single array containing all message files. Definition at line 38 of file mergeMessageFileList.php. Definition at line 39 of file mergeMessageFileList.php. 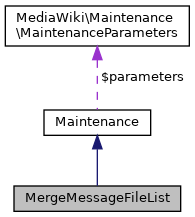 Definition at line 54 of file mergeMessageFileList.php. References $mmfl, $points, $wgExtensionEntryPointListFiles, as, Maintenance\error(), Maintenance\fatalError(), Maintenance\getOption(), Maintenance\hasOption(), and readFile(). Definition at line 126 of file mergeMessageFileList.php. References $IP, as, Maintenance\error(), file, and RUN_MAINTENANCE_IF_MAIN.